Step 1: Download the Mac software. The download will be in the Downloads folder. Open that folder to see your downloads. Select the Accountable2You zip file to expand the program. Step 2: Select the Accountable2You icon to start Accountable2You. When prompted by your Mac system, click "Open". If you opened the program directly from your downloads folder, you will see the following prompt. It is recommended that you select "Move to Applications Folder". The program will automatically open after this step. If this occurs, click 'OK' to close this window. Then, right-click on Accountable2You and select 'Open' (for users without a right-click mouse, hold the "control" key and click). When the next window pops up, click 'Open'. Step 3: Register the application. Enter your Accountable2You Account Name, Password and a name for this computer. The computer name can be anything you want it to be, this will be how your device appears on your accountability reports. Then click "Log In". Step 4: Review the terms and conditions. Please take a moment to review the Terms & Conditions before proceeding. When you are finished, click "I Agree to the Terms & Conditions" to continue. Step 4b: Assign to a specific user (For Family Accounts Only). If you have a family account and you have entered the managing user's username and password, the next screen will show all sub-users in your account. Highlight the name of the specific user to whom you want to register this device and click "Assign to Family Member" below. Step 5: Setup Accountability Partners. Click "Go to Partner Setup" to be taken to the Accountable2You website where you can designate accountability partners for your device. If you wish to do this at a later time, click "Later" at the bottom of the window. Step 6: Validate that method of detection is enabled. Select the AU icon at the top of your screen and Select Diagnostics. Step 7: Press Run Diagnostics and check the Detection Method. If the method says Disabled then continue with the tutorial. Otherwise the software is recording and no further action is needed. 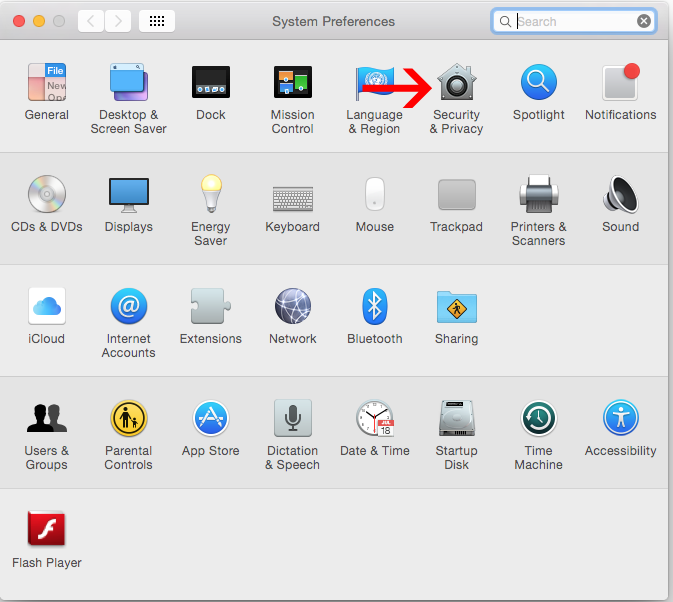 To setup the detection method you'll want to open System Preferences. Select the Apple icon. Then System Preferences. Step 9: Select Security & Privacy. Step 10: Select Accessibility from the list. If necessary, unlock the screen by checking the lock button. Then check Accountable2You. Once this option is checked Accountable2You will start recording records. 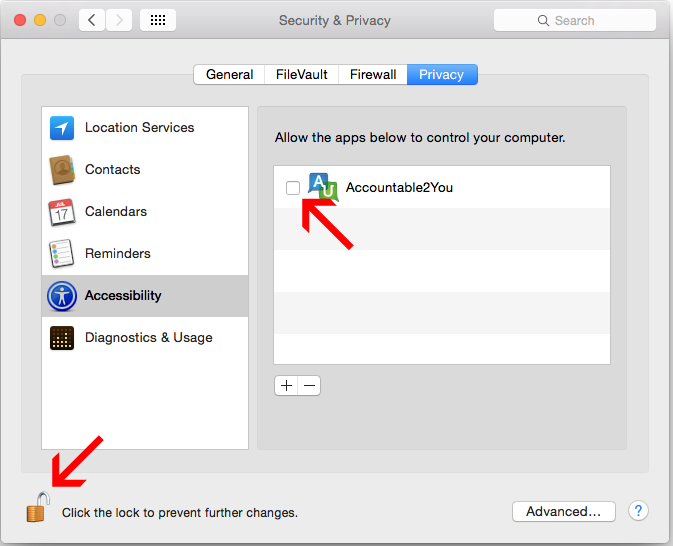 Accountable2You for Mac offers an option to exclude certain applications from monitoring, if this is necessary for privacy purposes. For instructions on doing this, please check out our App Exclusion for Mac guide. Keep in mind that Accountable2You can only monitor the profile on which it is installed. For Mac computers with multiple user profiles, be sure to repeat the install process for each user in order to ensure full device accountability.